Yesterday I joined a few of my Fit Fam from 12th Street Gym for an evening of fellowship, food, wine and painting at Painting with a Twist. Attendees were asked to bring a dish and wine to share with the group. I made a shrimp dip I found on the Whole Foods site and tweaked it just a bit. 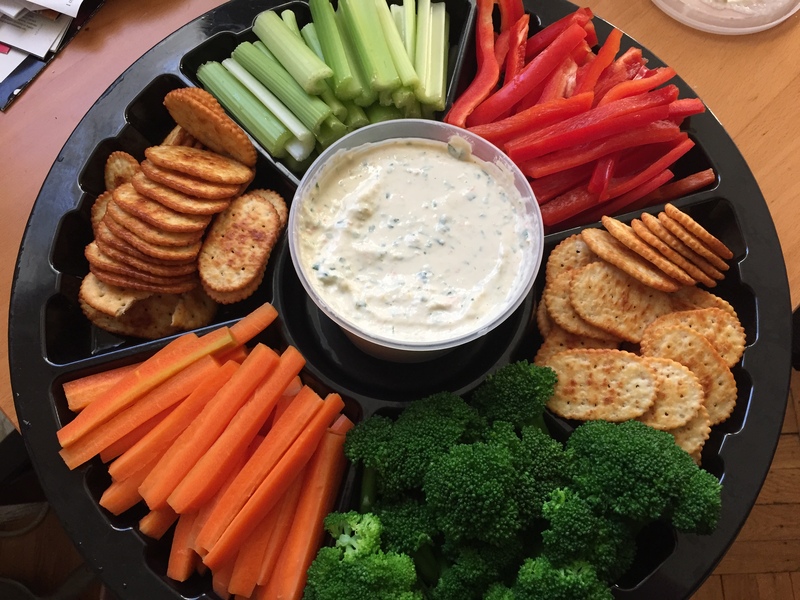 Served with some fresh veggies and crackers, it was a hit. 1 whole lemon. The zest and the juice. 1 tablespoon of sriracha AKA 1 big squirt! 1 tablespoon of Pickled Sliced Jalapenos, 3-5 rings. The lemon and sriracha set it off!!! I blanched the broccoli and carrots for that nice pop of color and vibrant taste. We laughed and painted and had a blast! Thanks for the invite, Peanut. In 2012, I started in the University of the Arts continuing studies certificate program for web design and development. After several curriculum changes and time commitments taking precedence, I stopped. Earlier this year, I decided to look into what I needed to finish the program. I discovered it wasn’t the same program. The name had changed, none of the old instructors appeared to be there, and one of the hardest classes I’ve ever taken in my life was not even going to count toward my certificate. That and the fact I had to pay a readmission fee was almost enough to turn me off. Alas, my inner smart girl got the better of me. I want to learn to code web pages. Not for a job change or anything, but more for personal enrichment. Since coding has a common thought process, I can see how it will help me in my job in the way I’d write scripts to automate processes and who doesn’t want to make their lives easier. So, I signed up, paid my fees and I’m in there. Classes start Monday and I’m picking up at Web II. I’m really excited and nervous at the same time. Yes, I’ve been doing some HTML/CSS since 2012, but to be back in class, behind a computer will be different. My goal is to get more into web development and dive into the LAMP stack with the Server-Side Web Development – PHP + AJAX class. I hope to learn enough to move this blog over to my own hosted site and maybe learn to make themes or at least make them look and feel like I want them to. I hope to post more updates as I progress through the class. Stay tuned!